I rode classic Arizona trail conditions: dry, hardpack, loose over hardpack, and rock gardens. They are a fast roller for sure and their performance is superb in everything but loose over hardpack – arguably one of the toughest condition to excel in. I’ve heard from a fellow AZ rider that the Weirwolf excels in that department. On the front, the Wolverine tended to wash out cornering on loose over hard trail conditions such as those at the San Tans and Hawes. Other riders I talked to said the same of their experience with a Wolverine on the front. I found that lowering the tire pressure to about 26 really helped with cornering (I only weigh 150 so I can do that). Plus a conscious effort to keep more weight on the tire as I turned helped too. Where the Wolverines really rock up front is on the rocks. Tech descents on South Mountain filled me with confidence, the tires stayed glued to the stones. I give the Wolverine a solid B up front overall, bumped to a B+ if you ride just the dry desert rocks. I give the Wolverine an A for climbing on the rear. Hammering up steep pitches on the singlespeed, I have yet to slip. Over rocks and tech the grip is just right. I’m not a weight watching gram freak, but these tires are light. 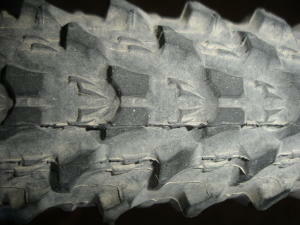 They compare pretty tightly with Maxxis Crossmarks, which I had on before the Wolverines. So if you like to spend your time in XC tech, the Wolverine will take you where you want to go. MTBR user reviews give the Wolverine 4.5 out of 5. A thread on the MTBR discussion forum also gives some positives and negatives of the tire. Running them with a Slime tube. I’m not a fan of ghetto tubeless. For me it’s UST or a slime tube. I see you’re loving your Mach 5. That is one sweet bike. I’m curious to see if you were running those wolverines with a tube, or ghetto tubeless with something like Stans?